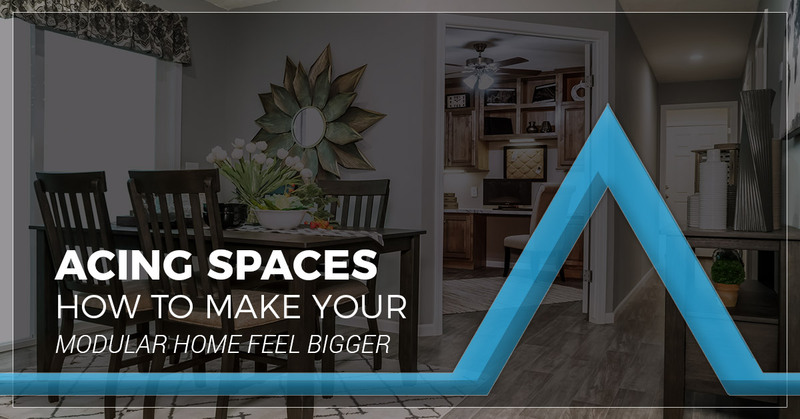 Whether you’ve owned your modular home for years or just invested in the modular home of your dreams, there’s always a good excuse to decorate your space. Modular home technology has improved ten-fold in the past decade, but it’s important to keep in mind that modular home spaces can still feel small — that’s where home decor comes into play. The more you can keep your modular home layout and space in mind, the better your home will look and feel. 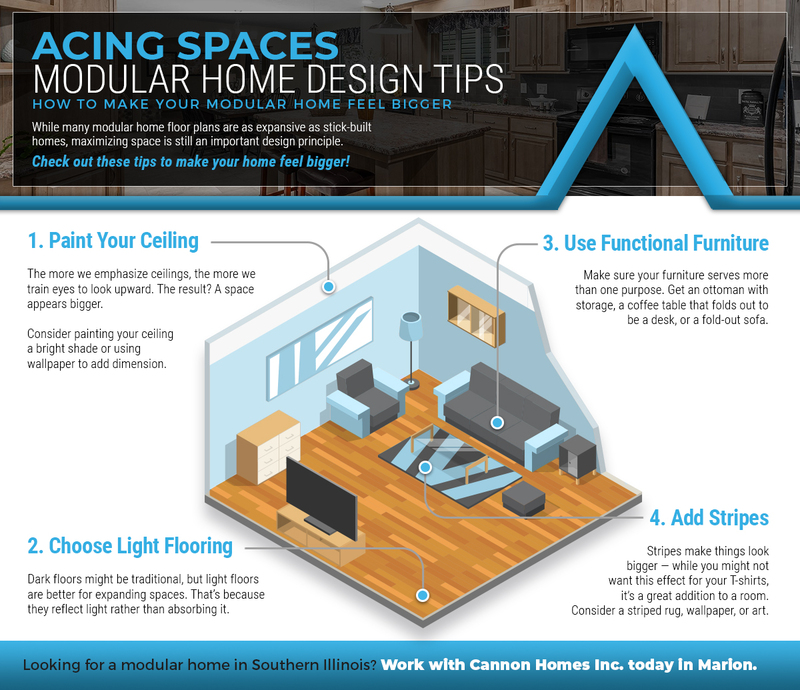 Check out these modular home decor tips today from Cannon Homes Inc.! If you’re in the market for a new modular home in Southern Illinois, be sure to visit us and check out our online gallery. In general, the darker the walls, the smaller the space. When you choose a lighter, warmer color, on the other hand, you effectively make the space feel bigger. If you have a tight hallway or a smaller kitchen, brighter colors can be the difference between a cramped space versus an inviting floor plan. This might seem like a tiny detail, but painting your moldings, trim, and quarter-round can also make your rooms look much bigger. If your living room is off-white, you’ll want to paint your molding a brighter, glossier white. Whatever the wall color, just make sure the trim is brighter. When the wall trim is brighter and lighter, it has the effect of making the walls appear further back. It’s amazing the difference mirrors can make to your modular home. Mirrors are for so much more than a quick hair and makeup check. In fact, mirrors are like the jack-of-all-trades for interior design. Choose a focal point of your room — this could be a fireplace, stove, piece of art, lamp, or furniture fixture. So long as the focal point is where you want to draw attention, anything goes. Once you have a focal point, angle your mirror so that it reflects the focal point. You could also place a mirror near a window because the mirror will reflect the natural light into the home. A well-placed mirror can essentially double the natural light that you see in a room. This tip is counterintuitive, but it actually makes more sense to keep furniture away from the walls. Keep a few inches, at least, between the wall and bigger furniture items such as sofas, sectionals, end tables, and dressers. It’s a matter of science and the way our eyes perceive barriers that explain this phenomenon. The more emphasized a boundary is (think: furniture right up against the wall), the more our eyes perceive the boundary as limited. If you’re short-statured, this tip might not be the best option for you. If not, (or if you’re willing to invest in a step stool), one of the best modular home design tips is to hang shelving closer to the ceiling. When you hang shelves higher up, you train the eye to move higher up. This decor tip makes the room seem longer and bigger. It also maximizes vertical storage which is one of the best assets of any home. If you’re looking for a modular home in Southern Illinois, including Marion, Mount Vernon, and Salem, Cannon Homes Inc. is your Top Rated Local® modular home builder. As an exclusive Redman Homes authorized builder, we also have some of the best modular homes in the market.